Legendary figure in Porsche racing. Worked initially as head of Porsche racing vehicles for Vasek Polak 1969. 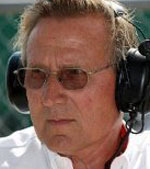 Co-founded ANDIAL in 1975 and was VP for over 21 years (1975-’96), providing racing services to a wide spectrum of Porsche race car teams, including the Porsche 962s which won 50 IMSA races in the mid-’70s. Consultant to Porsche Motorsport N.A. 1990-’96, President of Porsche Motorsport N.A. from 1997-’04, then consultant again 2004-present.